Oh the eye pic totally goes with the card you have created - I know you are back to "normal" now so have a great Saturday. Loveeeee that card! So fun! And great news on your eyes!! Funny ... my sight got worse when I lost weight! LOL!!!!! What a cute card - brought a smile to my face this morning. Cool card and a great eye picture too. Yes, Fall is knocking on the door and it feels that way too! There is a crispness in the air most mornings now. I didn't know eyesight could improve with weightloss! Totally awesome card! I love it! Hope you've recovered from your eye test. Love your cards. Eyes are a perfect Halloween item lol. Also glad I found you (through clicking on your name from another blog) can anyone tell me how to save your blog, so I can see it regularly without pot luck searching by name lol and get updates ect? Please. 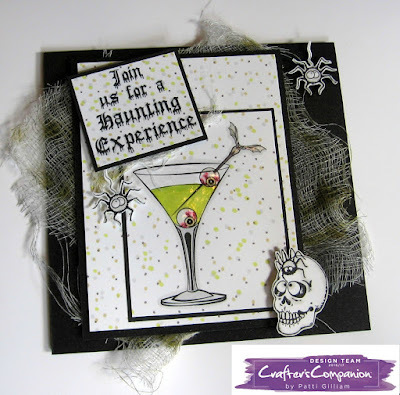 WOW, creepy drink for sure, but love the card, such fun! Beautiful eyes and a Boo-tiful card. What more can one ask for?